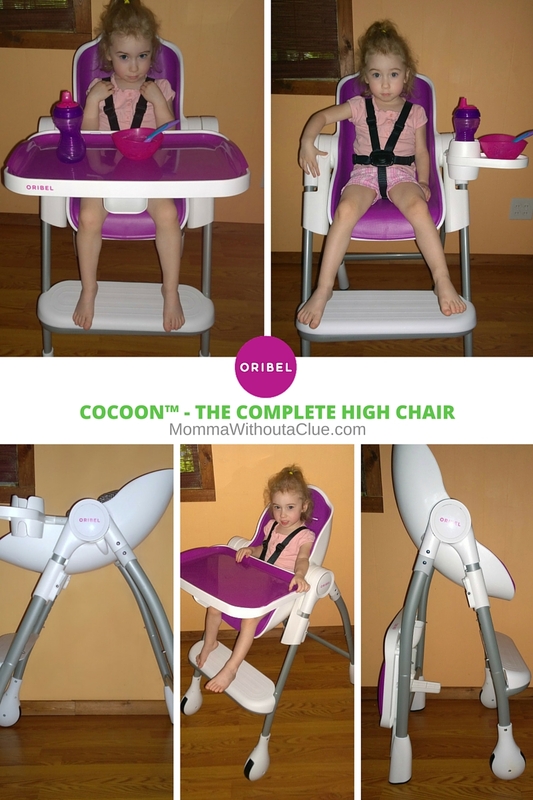 I was so excited to introduce the new Oribel Cocoon™ Complete High Chair in this post, and Oribel sent me one to test out for you guys, to show how it works and what my thoughts are on the actual product. First, let me tell you about the Cocoon High Chair. This innovative piece of baby gear is probably one of the coolest things I've ever seen. 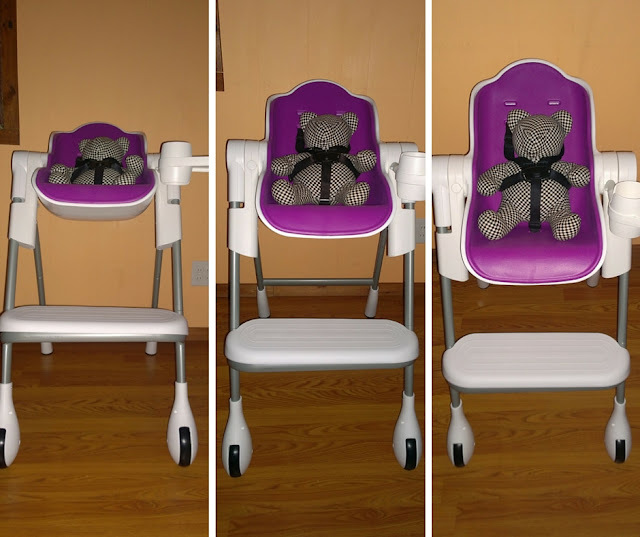 It was inspired by butterflies (hence the Cocoon name) and it actually "transforms" into the perfect chair for every stage of solid feeding baby goes through. 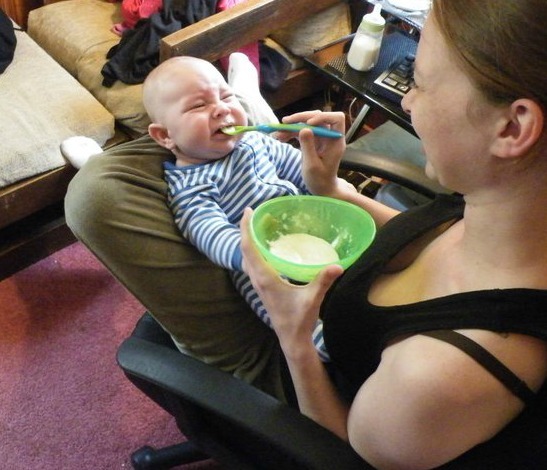 When my little guys were babies and trying their first bites of pureed baby food, I used the "Mom Hold." You know which one I'm talking about: the foot propped up on the opposite knee to make a little nest for your little one to prop on while you juggle the bowl and spoon? Yeah, I think I ended up wearing more of their food than that actually made it into their mouths. I really wish I had had something as nifty as the Oribel Cocoon High Chair when my little guys were little enough to use it all the time! Straight out of the box, it required a little bit of assembly. I was a little nervous seeing how many pieces there appeared to be, but setting it up was really easy. 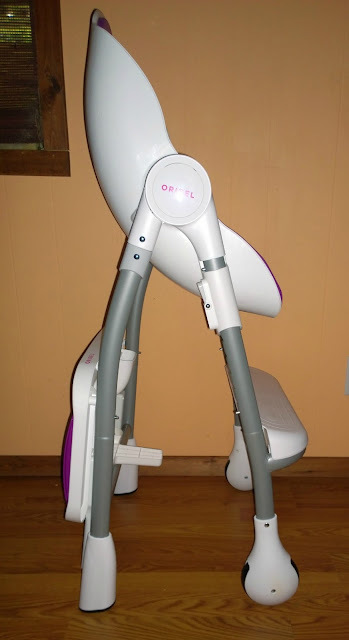 The seat is one piece and slides right onto the front legs, which connect to the back legs via the hinge piece. Attach the footrest and the tray, and done! As soon as I got it together, Kaya was begging me to let her sit in it. The bright purple "Plum" color is really inviting, and my little threenager informed me, "Purple is my favorite color, so now this is my favorite chair." It really does live it up all that it claims, and believe me, I made sure. First of all, the reclining seat. 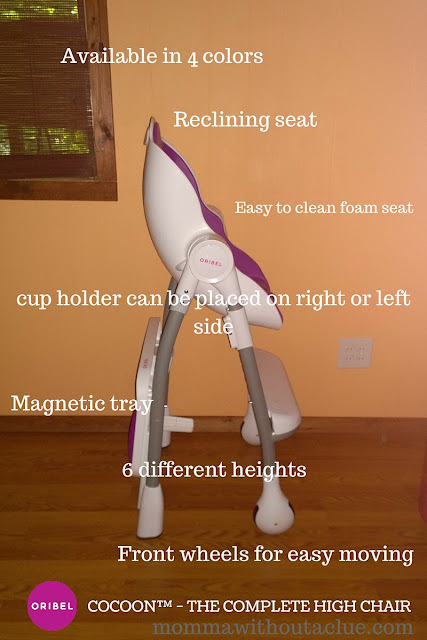 There's a little handle on the back of the seat that lifts and reclines the seat down to an almost laying-down position for bottle-fed and first taste feedings. The second position is a little more upright for when mom is feeding baby, and then the third position is straight up for self-feeders. Kaya is a little too big to actually test the fully reclined position, so I just snapped a couple pictures with a baby-sized teddy bear we have, so you guys can see what I'm talking about. Now, obviously, you'd have to adjust the straps to fit your baby, but there are three different height adjustments for the safety straps, with a five-point harness that makes sure that your little one is safe and secure. 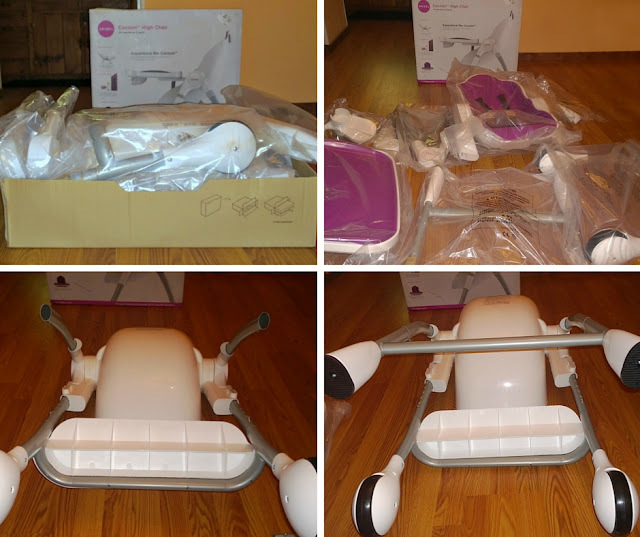 Something I thought was a really neat feature - the Cocoon comes with a cup holder and bowl/plate tray that attaches to either the right or left side of the seat to feed baby whichever way is most comfortable for you. See where Kaya's thumb is on the left side of the picture? There's a flap covering the tray holder right there, where the cup holder attachment just slides right in and clicks. It's secure; we tried wiggling the seat and the holder and it stayed - meaning Mom won't be wearing baby's food from an accidental turn. 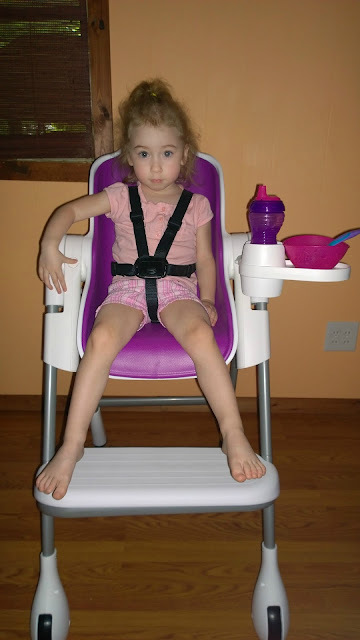 Once your little one is ready to try self-feeding, the cup holder can be easily switched out for the big tray - again easy installation, just push and listen for the click. What I really like about the tray is that the top comes off for easy cleaning and is dishwasher safe up to 160°F. 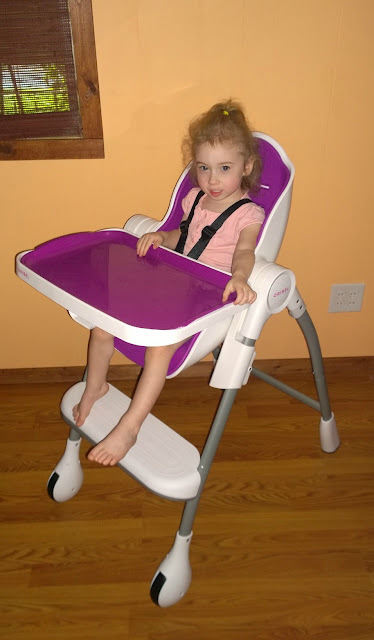 After your little one is finished eating, the entire high chair folds up and the tray attaches to the bars on the back for easy storage. Definitely takes up less space than when it's fully opened, and stood up against the wall beside our dining room table. 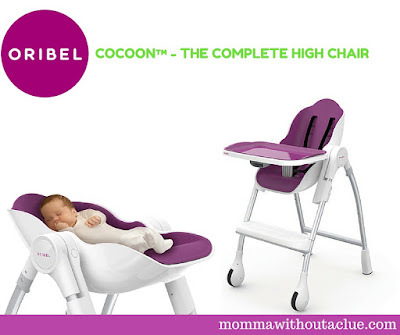 All in all, the Cocoon™ is exactly what they claim - the complete high chair. I recommend this from baby's first bite all the way up to three years old. New to North America, this company registers the perfect balance between smart design and striking looks, befitting the busy lives of parents while helping them. Utilizing in-house design and production expertise, Oribel can respond to changing tastes while ensuring top quality and safety. This allows them to innovate, explore and deliver signature products for modern, happy families that engage children. They know that behind every happy baby is a set of relentlessly proud parents! To check them out for yourself, visit LoveOribel.com. You can also find them on Facebook, Instagram, and Pinterest. What did you use for your little one's first bites? Disclaimer: As stated in the first paragraph, I did receive a complementary sample for review purposes. All opinions are my own, and I only recommend products that I use or think would be a really good fit for you, my readers.